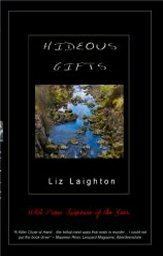 Liz Laighton is the pseudonym of an Aberdeenshire bookseller and zoologist who happens to be descended from Thomas Laighton, the keeper of the Isles of Shoals light. Liz was born in Boston, Mass., in 1949. It was a bitterly cold night but she claims to remember little of it. She speedily grew to be a thorn in the flesh of her schoolteachers, in spite of their lack of interest in flesh. After high school she eschewed learning and sneaked off to Liverpool to seek a theatrical career. She didn’t find one. She did however manage to bump into the talented and fearless musician Fluff, whom she married in 1970. Laighton drifted into bookselling in 1971 and became deeply enamoured of the trade. Unfortunately she has no rapport with the shopping public, so she drifted out again. In any case she gets on better with animals. In 1977 she began to work with pigs. Eventually she gained a certificate in agriculture, which was meant to make it easier to find farm work. In fact it made it impossible. No one wants a smart-arse farmhand. Steadfastly refusing to learn from this error, Liz went on to study zoology at Aberdeen University. She gained two degrees, and produced some fine original research, chiefly concerning ants. Sadly, there is no future in ants these days. With tragic inevitability Liz drifted into bookselling for a second time. She wrote the first of the Marchbank murder mysteries, A Killer Close at Hand, during long hours of shop down-time. A Killer was self-published with Publish and Be Damned in August, 2004; it is followed by Hideous Gifts (UKA Press). The third book, The Moon and I, has not yet been offered for publication. Liz is a member of Huntly Writers’ Group and turns out occasional short stories. Otherwise, she has few hobbies, and when interviewed she couldn’t remember which ones she had given up. When not in the shop, she is probably chivvying hapless ecology students across tracts of desolate moorland, or else walking the dog.